Outlast technology enhances textile based products by providing the benefit of temperature regulation to proactively manage heat and moisture in the micro climate between skin and textiles. As a company committed to temperature regulation, Outlast can give you the technology to provide more comfortable solutions to everyday life. Brands that want to offer their customers greater comfort will value the Outlast difference. When managing temperature, heat, and moisture, your customers can feel "just right." Outlast technology is NOT wicking technology, which manages moisture by reacting to sweat and pulling it away from the skin. Outlast technology will proactively manage heat while controlling the production of moisture before it begins. THAT'S the Outlast difference. Outlast technology, originally developed for NASA, utilizes phase change materials (PCM) that absorb, store and release heat for optimal thermal comfort. When you begin to get too warm, the Outlast technology will absorb and store excess heat radiating from the skin to reduce overheating and help prevent perspiration. When you begin to cool down, the stored heat is released, reducing chilling. By proactively and constantly managing heat, the smart materials in your products regulate temperature so your customers feel not too hot, not too cold but "just right." Whether you want to purchase Outlast fabrics from us or you want to source fibers and knits direct from one of our certified spinners or mills, Outlast is ready to work with you. 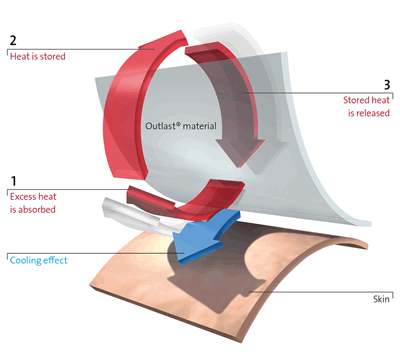 Outlast Thermocules™ as coating on textiles: Outlastcoated materials offer a higher capacity to store heat than any of our other applications. Outlastcoated materials are intended to be used in products that are not in direct contact with the skin (i.e. 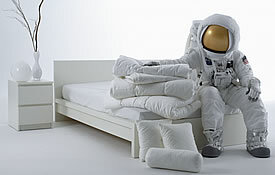 footwear, bedding, outerwear, etc.). We offer a wide range of coated fabrics each highly suitaable for its specific end use and product set-up. Outlast Fiber: In our in-fiber products, the microcapsules containing Outlast technology are located inside the fibers. The Outlast fibers are spun into yarns, and then made into fabrics or finished products. In-fiber applications are for products being worn next to or very close to the skin. Acrylic – Outlastacrylic fiber can be used in a variety of products including socks, hats and sweaters. Viscose/Rayon – Outlastviscose is used in such products as shirts, dresses, sleepwear, intimates, work wear and sportswear. Polyester – Outlast revolutionized polyester with the Outlast polyester fiber. This bicomponent fiber contains a PCM core with standard polyester as the sheath. Outlast Matrix Infusion Coating (MIC): An advanced formulation of Outlast Thermocules™ are finely printed onto the flat fabric. OutlastMIC is intended for products worn next to skin, and is perfect for the active, casual and sportswear markets that use compression fabrics. It can be used on virtually any fabric, including cotton or cellulose-based fibers. Outlast employs the highest standards, and continuously tests all products that contain Outlast® technology. Outlast certifies its suppliers through each step of the supply chain to ensure that the benefits of Outlast® technology are passed along to the consumer. Outlast Technology in Bedding – Outlast technology proactively manages heat and moisture to provide a better, more comfortable night's sleep. Bedding products featuring Outlast include comforters/duvets, pillows, mattresses, mattress pads, blankets, sleeping bags, bed linen and pet beds. Outlast Technology in Apparel – Outlast technology takes apparel comfort to the next level by proactively alleviating spikes in skin temperature that cause discomfort. Such products that benefit from Outlast smart temperature regulation include fashion, active wear, safety & work wear, knitwear, underwear, and pet apparel. Outlast Technology in Footwear – The heat and moisture management benefits of Outlast technology are significant in footwear. Tests show that Outlast materials can reduce perspiration in footwear by as much as 44%. Outlast footwear products include socks, insoles, sneakers, shoes, boots and safety gear.Outlast Technology in Other Applications – A major benefit of Outlast technology is that it can be used almost anywhere that heat and moisture management is required. Outlast industrial applications include labeling and packaging, seats and furniture, military/law-enforcement as well as medical applications like bandages or wheelchair cushions. Outlast Technology in Industrial Applications – A major benefit of Outlast technology is that it can be used almost anywhere that heat and moisture management is required. Labeling and packaging, garden furniture, wheel chair cushions and military/law-enforcement, and electronics applications are current Outlast technology industrial applications.